An accessory is the reflection of your image. If you want to show everyone that you appreciate tolerance and peace, this pendant would be an ideal choice. It is using white gold as the base of the design. 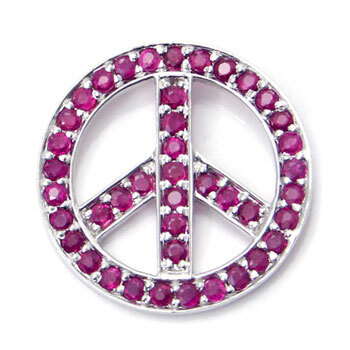 In addition, to fill in this peace symbol, the bright color of ruby stones are placed carefully, getting a real captivating look. It is the perfect piece of jewelry to look stylish, and at the same time to show who you really are.